Download MTK IMEI Tool to flash single IMEI on any MediaTek (MTK) devices including smartphone, tablets and even feature phones. If you have been searching the right and simple IMEI flashing tool for MTK device, then MTK IMEI Tool I am sharing now can be your right considerations, anyway this tool is a free tool. MTK IMEI Tool is a very easy to use tool that allow you to perform IMEI writting on MediaTek device in few clicks. Just plug your MTK chipset device to computer then open the MTK IMEI Tool, afterward click the Write IMEI button provided to begin flashing IMEI on your MediaTek chipset powered device guys. The tool is very small only 6MB in size and will not eat your Windows based PC storage at all. 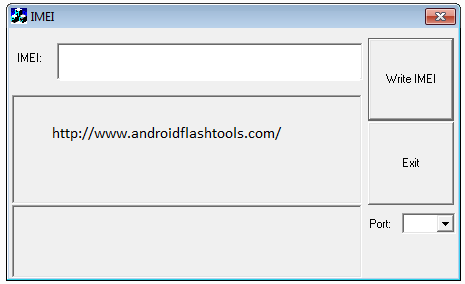 This tool only allows you to flash a one IMEI only. That means if your device's DUAL SIM then it can not work. Find your IMEI Number guys. To know your MediaTek IMEI Number simply dial *#06# from your MediaTek smartphone, tablet and faature phone. Alternative tools for you guys. There other options for you to use to write, flash and change IMEI on MTK device such as download WriteCode IMEI Tool To Write IMEI On MediaTek and MTK IMEI Repair Tool (MTKDroidTool). Credits. Credits should be given to AppWizard to create, maintain, improve, develop and release this tool for free.